Congratulations on Zollan, he was very quiet for the rest of the night :p. The officers decided that we couldn't have an unenchanted Warglaive in the guild, so I enchanted it with mongoose with gbank-materials. The last hour of the raid was used to kill 3 bosses in Mount Hyjal. Friday we originally planned to go to MH, but it was friday, so people came on late, and we went Onyxia/AQ40 instead. There's a thing about old-world instances, everyone wants to see them, but tbh, I don't like tanking them. People forget to watch Omen, and it went that bad, that I actually left the raid for 10 minutes to cooldown. 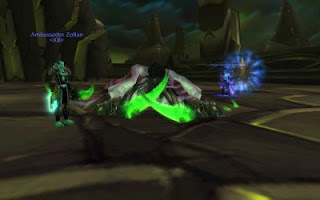 I play a Maintankadin, my game is to stay in control of the situation, and in normal raids I can do that, the DPS is then focused enough to watch omen (most of the time), but in old-world-raids, they tend to forget omen, so after the third time that I had the dps open up before I actually controlled the mob, I needed to step out. We cleared up until Chtun, where we arrived at 0.00, so a lot of people left. We actually wiped several times on the emperors, to get the fight down. emperors is a fight where tankadins shine, they can tank both, because we do both physical and magical damage. But, let me give you a tip, dont use Seal of Corruption, it's a DoT, so we actually had 2 wipes to figure that out. A Tankadin having aggro on 2 emperors is not funnu :p.
After AQ40, I joined my Brother in Kara to kill Nightbane. I started as Prot-specced healer on attumen and the new boss. Then Caden had to go, so I tanked Moroes and Maiden with Chemp (resto-shammy) and Theoden (elemental-shammy) Healing me. After that Theoden had to go, but we continued. So, seven people left, 1 tank, 1 healer, and 5 dps. And we got Romeo and Julliet, which went down fast. Up to Nightbane, one of the 2 endbosses in Kara, and we killed him, with only one healer...It feels more like an heroic now.